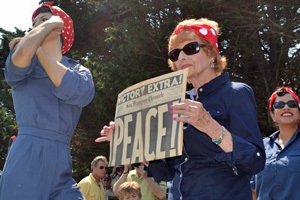 Elinor Otto is one of the original “Rosie the Riveters”, who built aeroplanes for 50 years and retired at the age of 95. She worked at the Rohr Aircraft Corporation in California when the male workforce left to fight in WWII. One of Elinor’s goals is to help inspire young women to live lives of independence, achievement and compassion, and she is also a champion of the health care of older women. In 1942 I got divorced. I had a little baby. In those days is was hard for women to get a job. I didn’t like office work at all – it was boring! 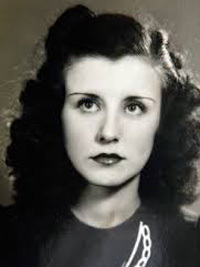 So, I did car hopping – parking cars on the lot of a restaurant – for a while, but then I saw an advert for women to replace men who’d gone to war by working in factories. They needed to keep building the airplanes. They also had women working on building battleships – one of my sisters worked in San Francisco and that was what she was doing, whilst my other sister and I were riveters. We worked at Rohr Aircraft in Chula Vista in San Diego. At first men resented that women were coming to take their place – not all the men went to war. Those that stayed weren’t called very nice names because of it, but some men weren’t able to go to war if they had medical problems. So, they hired us in right away and there was no time for formal training, so the men had to teach us different jobs as we went along. Different jobs came in, they’d get shared out and we’d do them. And we’d do them fast. It’s seen as something big today but at the time we just took it for granted. We were replacing men who’d gone to war and we just got on with it. Just a few days after the war ended in 1945 we were gone, but we didn’t resent it because we knew what we had to do. It was nice because when the men found out how hard we worked, how anxious we were to learn, and how we were willing to work extra hours, they were so kind and generous with us, helping us. They were proud of us. When I was working during the war there was a record called “Rosie the Riveter”, which has many verses to it. It was a ’78 record (or phonograph) that you had to wind up. We’d play that on days that we didn’t feel like going to work, and it gave us the incentive that we needed to get dressed and go to work at 4 o’clock! There were a lot of divorces and marriages breaking down though as women started getting independent. I was making 65¢ an hour and at the time it felt like we were rich! I could take care of myself. If women weren’t in a happy marriage they could get divorced and start taking care of themselves. 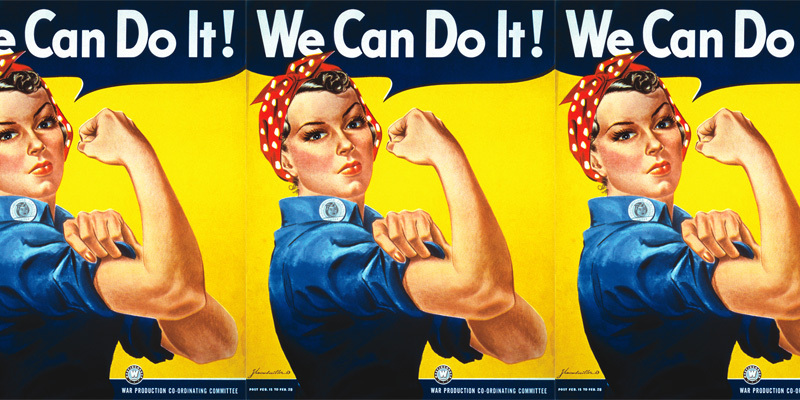 Today we have many “Rosie the Riveter” organisations. There are many “Rosies” out there but I seem to get a lot of attention because I worked longer than any other “Rosie”. I was 95 and still making airplanes until they closed the plant down. I really enjoyed physical work – being on my feet – and I was still able to do it at 95. I had no problem. I’m 97 now and I can still get around! I still do a lot of walking, driving and all these thinks that I always did, although I can’t hear as well as I used to after working with airplanes for 68 years, but I’m grateful that’s all I have wrong with me right now. My grandson goes on trips with me with the other “Rosies”. On the 6th April the veterans have invited us to go to Washington. I’ve been to Washington, New York and all these other places for Veterans Day parades. I also enjoy the banquets. I’m shy and I was nervous the first time I had to get up and make a speech in front of people, because I never thought I could do that as I was growing up, but then all or a sudden, there I am in front of thousands of people, making a speech! It’s amazing what people can do when they have to! 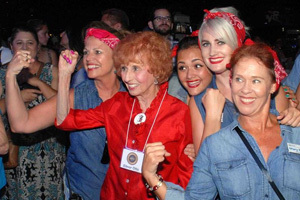 Elinor is a national spokesperson for Spirit of ’45 Day and ‘Rosie Rallies’, and has also agreed to be a spokeswoman for a proposed ‘National Rosie the Riveter Day’. There are also activities planned for 2020 to mark the 75th anniversary of the end of WWII.